I am taking the silence as a yes. Here is my starting picture. Page 1 Bryan advised he was building a SdKfz 251 and there was no objections.... so you are fine - precedent set. Super, Peter. 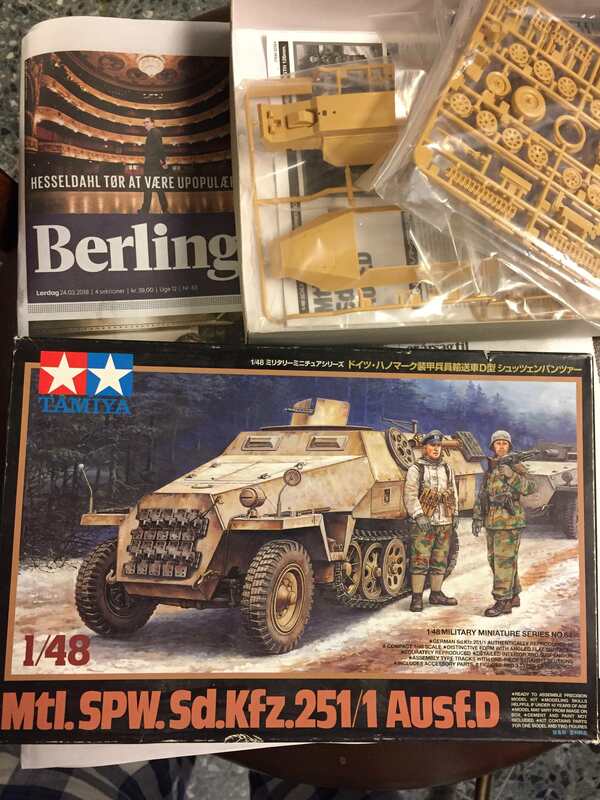 I did not notice someone was already building a Sd.Kfz. 251. Got the hull started. What a confusing mess. The instructions leave a lot to be desired. I lost one of the transmission vents ( I think that's what it is) and had to make a copy. Yes they are vents over the steering brake and differential gear housings. A little progress on my 251. I have decided to use this build to test some camouflage in decals form. Jesper. Do you sleep? The rate you churn out models is amazing! Finished weathering my panzer 1. Nothing excessive, mostly sand inside cramped interior, making it difficult to use broom. excellent work Darius. Love it. One third of wiring (painted fishing line) done, two to go. I've ordered Bronco's early CV.3/33 with interior. I expect to start it mid or late May. A little progress on my build. it's time for me to pop up with my entry. I'll build the Showcase Models Bushmaster as a stalemate to my ASLAV (on the workbench too). This parallel build is a way to paint both vehicles in the exact shades of tan and green as I'll probably will do some mix. I'll post pictures tonight. I've forgotten to do so before I start the build. 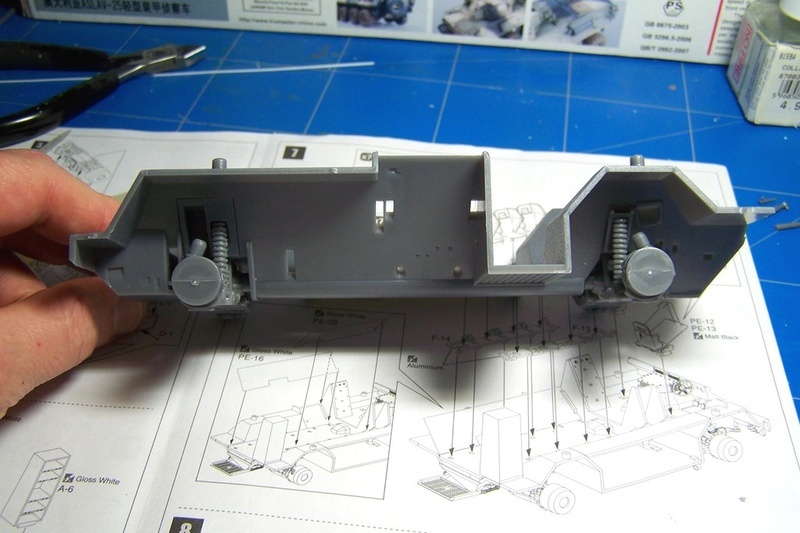 So far, after two evenings on the workbench I only have assembled the both axles. Fortunately it looks like the famous ride height is correct. I am sorry to say no luck on the photos yet. Neither of my 2 club members can find the set I gave them and Prime Portal still only has the ASLAV thumbnails that do not link to the full size pics. Made a little progress on the Nashorn. Got the wheels and tracks on, the sides finished and started on the fighting compartment. Instructions are absolutely horrible! Leaves parts out all together, wrong parts called out and shown in the wrong places. Instructions say 93 links for each track, but more like 104 each side. 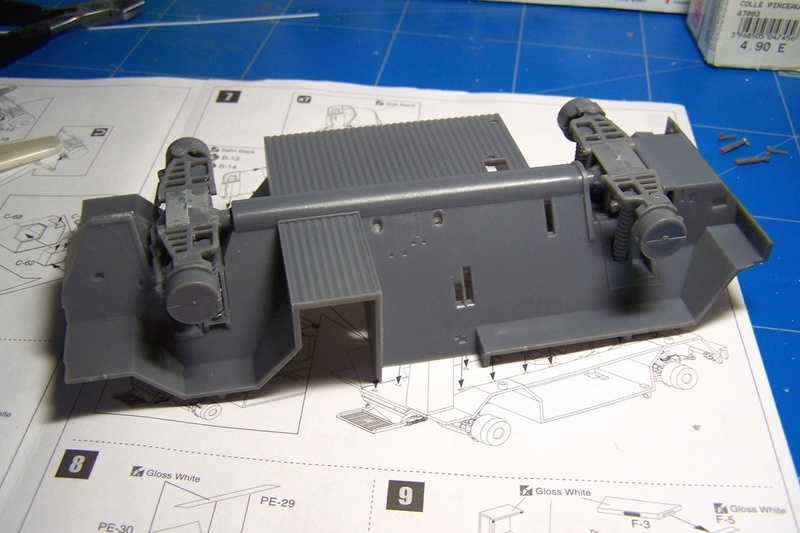 Anyway, next step will be the gun, finish the fighting compartment and throw some stowage on/in it. As I promised in my initial post, here are some pictures of the "chassis". My entry,a mid Tiger by RFM. You will want to have a look at this review. It highlights all the errors in the instructions, and there are a lot. The items in red apply to your kit. As my Workhorses Campaign build is on hold until my metal primer arrives, I thought I would go ahead and get started on my build for this campaign. It's the reissue, by Hobby Boss, of the original Tristar kit. Thanks Mark. Yeah, I saw that one fro Terry's site. I'm working on Dragon 6386. It's better than 6166, but still confusing. The detail is great, just have to pay VERY close attention to the instructions and do lots of research. I did not see this campaign until a few days ago and I happen to have a model that I started in March that is perfect for this campaign. 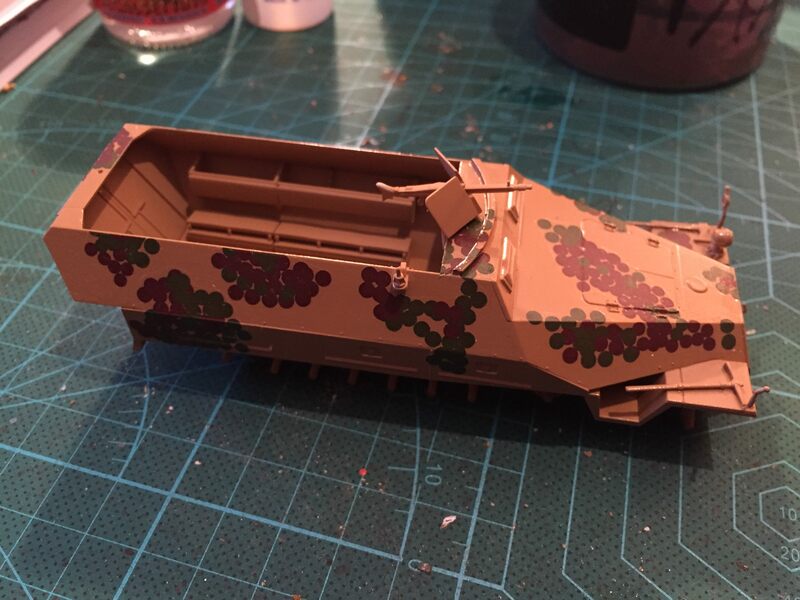 I am building the AFV Club M113 ACAV. I am building this model for a diorama. The model is going to depict a track from C Company, 2d Battalion, 47th Infantry (Mech), 9th Infantry Division as it appeared in December 1967. The track is C-13 nicknamed HARASSMENT. 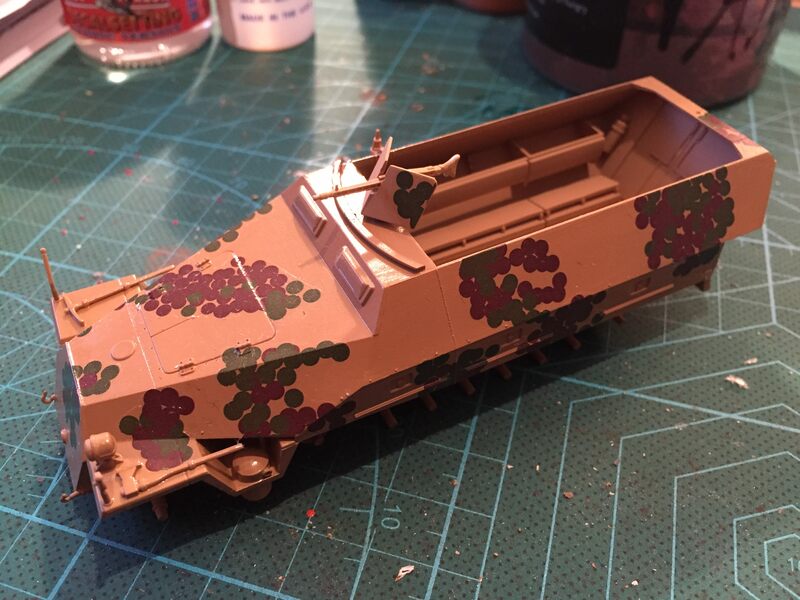 The tracks belonging to 2/47th Infantry (Mech) in 1967 through mid-1968 were gasoline powered M113s, so I had to convert the fuel tank into something that looks closer to the squarish type in the gas-powered tracks. I took the fuel tank that came in the kit and sanded off the roundness of the face of it and then covered it with some sheet styrene. I made the details of the access panel with wire and sheet styrene. 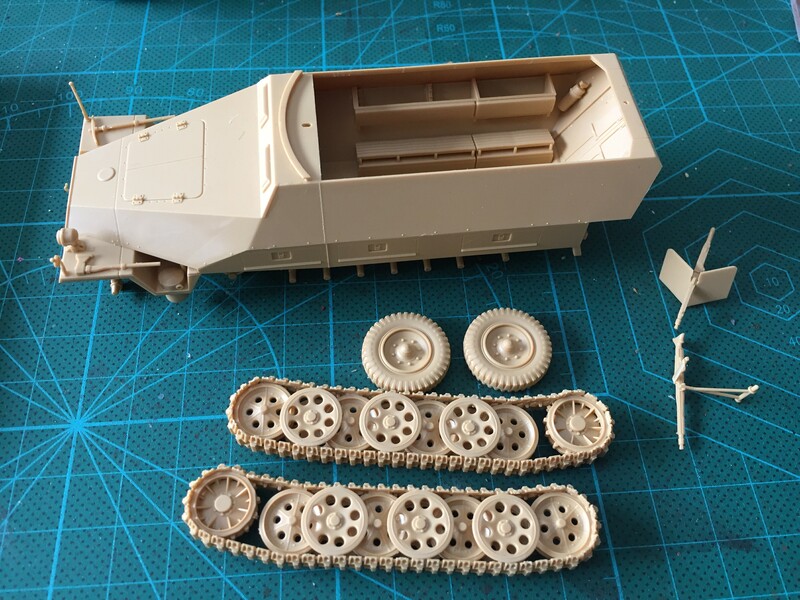 Although there are some nice interior parts in the AFV Club kit, it is also lacking a few in the driver's compartment, so I added some of those with items from the Academy kit and from the spares box. 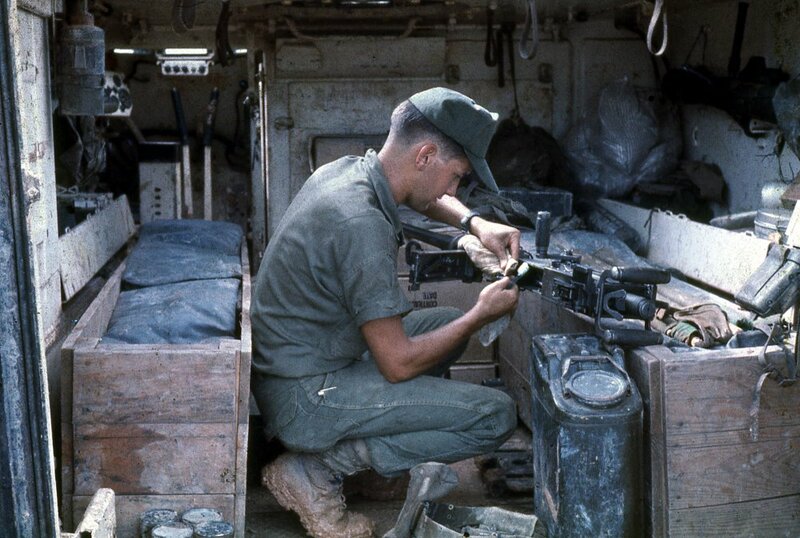 After priming the interior with white (gas powered tracks had white interiors, not the seafoam green that the M113A1 and later models have. ), I started to add the wiring and piping. It was SOP for C Company to replace the troop seats with wooden box seats that each crew made in order to organize their ammo and equipment. They were covered with vinyl seat covers. Here is a photo of my friend Bill Rambow performing maintenance on his .50 where a good view of the seats is presented. And here they are in 1/35 scale. I have pictures of all of the various stages of loading out this model, but I will spare y'all the boredom and space by just showing you how the interior looks so far. This unit did not sandbag the floors at this point of time. Their ammo is organized in the box seats, so there are only a few cans out in the open. Others will be on the top deck. Their personal effects were carried in used ammo cans and their clothing, etc were carried in WP or laundry bags. I made those from Magic Sculpt. The other items are from Mec Models, Bravo 6, Armand Bayardi, Duplicata, and others. 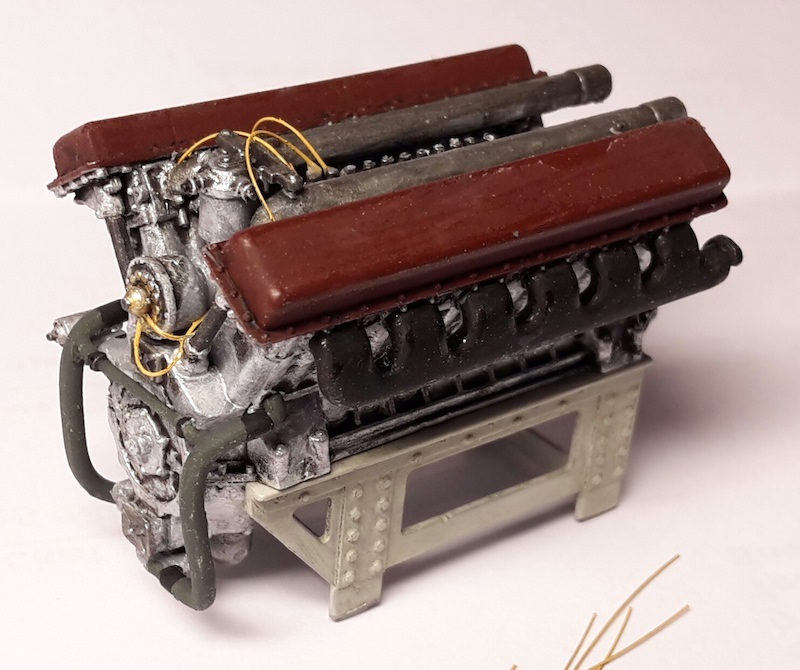 The magazines are issues from 1967 and the centerfold on the front of the fuel tank is from December 1966 ( a favorite Playmate of one of the crew members) in order to maintain continuity of the time period that this model is representing. I am going to have a guy sitting in the crew compartment reading a magazine and airing out his feet. The figure will be a conversion of a Bravo 6 figure from the Delta Blues set. The figure's right front was flat where the guitar was supposed to go, but since he is not going to be playing a guitar, I built that area up with Magic Sculpt and sculpted in the top pocket. 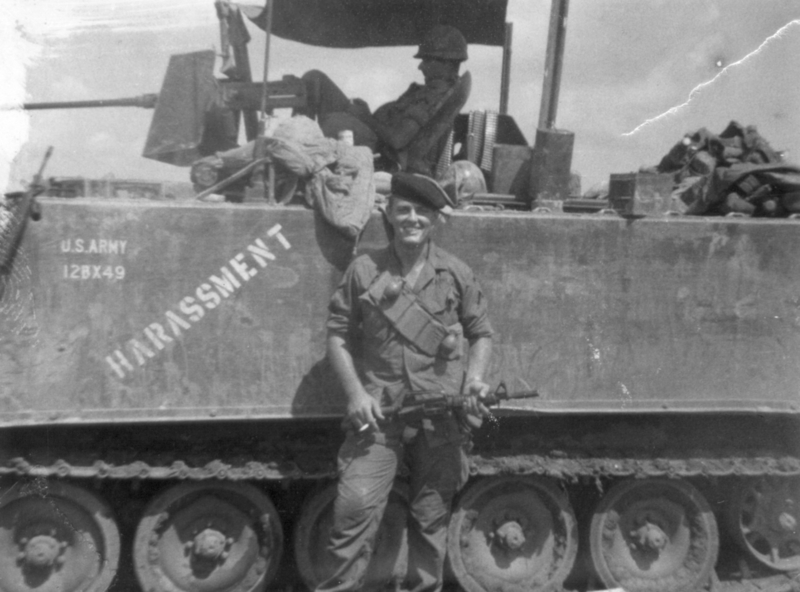 Since HARASSMENT has the rail of the track shrouds still attached to the sides of the vehicle, I cut the rails off of the kit-supplied track shrouds and glued them in place. I then heated up the rails with a hair dryer so I could replicate the dents and bends that were made in the rails while busting brush in the jungle. In hindsight I should have done this before I glued them onto the hull, but they came out close enough. That's is so far. I plan on doing more this weekend.